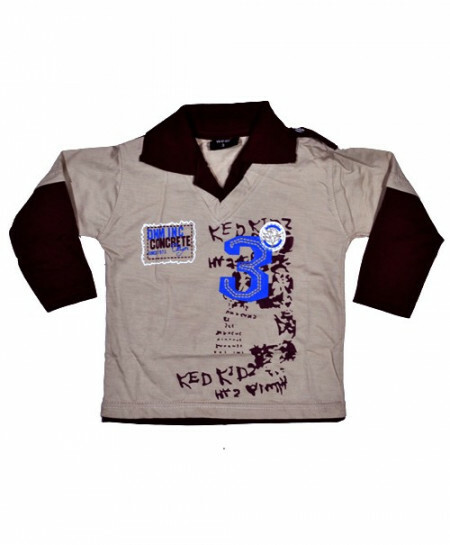 Dynamic 3 Collar Full Sleeve T-Shirt for kids from 3 to 5 Years old. These are not T-Shirt from the market. All the T-Shirt listed on the website are prepared specially for Techcity.pk clients. During all this process, our target remains satisfaction of our valuable clients. We ensure to deliver you T-Shirt that is worth the price you pay to us. All our T-Shirt are custom made for Techcity.pk, these are 60% Cotton & 40% Polyester Dynamic 3 Collar Full Sleeve T-Shirt single jersy (unless mentioned otherwise) knit T-Shirt which are reactive & disperse dyed. Our T-Shirt will give you more comfort and softness than ordinary T-Shirt that you may buy from market. All of our T-Shirt have perfect Design (unless mentioned otherwise). There are various factors that have to be conisdered in the print quality and we choose the best quality prints on the shirts we sell. We want the T-Shirt and prints to be durable and stay longer than normal.